The Merax Deluxe Indoor Cycling Trainer Bike is an entry-level machine that supports a higher maximum user weight capacity of 330 pounds/149.6 kg. It is a compact unit that will be appreciated by those that do not want bulky indoor equipment in their room or apartment for whatever reason. However, because of its compact design, it cannot accommodate people that are taller than 6 feet. Just as aforementioned, the bike possesses basic features that offer the opportunity to anyone in any fitness level to lose weight and tone the muscle groups. It has a belt drive and friction resistance systems which make the operation smooth and quiet. It has a 10 inches long seat that is fairly padded which could be adjusted 4 ways. The flywheel is not as heavy as the one on most spin bikes but it is ideal for those recovering from injury, the elderly and folks that simply want decent workouts that could help them achieve their fitness goals. The Merax Deluxe Indoor Cycling Trainer Bike is available in two color variations of red and blue. The two bikes have the same functionality except for the color. Click right here to have a peek at the discounted price of the Merax Deluxe Indoor Cycling Trainer Bike on Amazon. The Merax Deluxe Indoor Cycling Trainer is constructed with durability in mind considering the fact that it supports up to 330 pounds/149.6 kg maximum user weight capacity. The frame is made of heavy duty steel and coated with anti-corrosion and scratch paint to further boost its longevity. The seat and the handlebar posts are also finished with the same type of paint instead of chrome unlike the majority of indoor cycling bikes out there. The weight capacity it supports is a very good testament that the bike is very sturdy. It is also very stable because of its grand base framework that features steel front and rear stabilizer bars with adjustable rubber levelers underneath them. These rubber levelers help to balance the bike on an uneven surface. The bike is compact but not really a lightweight because it weighs about 107 pounds/48.5 kg which also boosts the stability by making sure that the bike stays grounded during intensive and rigorous workouts. If you are wondering how you can move the bike in and out of the storage area, you don’t have to be alarmed because it features two transport wheels at the front base which makes it very portable. The bike’s dimensions are 41 inches long by 21.3 inches wide by 48 inches tall. Differently put, the workout area for this bike would be 3.4 feet long by 1.8 foot wide and a ceiling height of at least 7 feet will suffice. However, you should consider adding extra clearance of 1 to 2 feet at the rear and on each side of the bike so that you can work out freely with safety. This bike is simple, affordable, compact, and with useful features that make it functionally inclined. The Merax Deluxe Indoor Cycling Trainer Bike has a 10 inches long seat that is also adjustable. The seat is well padded with high-density foam that provides the much-needed comfort and covered with a vinyl material that makes it durable. The seat’s comfortability depends on the user’s feeling because we observed some users say they are fine with it while some say they are not. Therefore, in case you feel the bike’s seat is not very comfortable you may use a gel seat cover to improve the comfort it offers. It could be adjusted 4 ways; i.e. vertically (upward/downward) and horizontally (forward/backward). The seat’s adjustability provides the user with the opportunity of finding a suitable workout position that is comfortable enough to workout longer and achieves better results. Moreover, this also makes it possible for users of different heights to be accommodated. Despite the fact that the bike has a compact design it can still accommodate users between 4.8 to 6 feet tall. 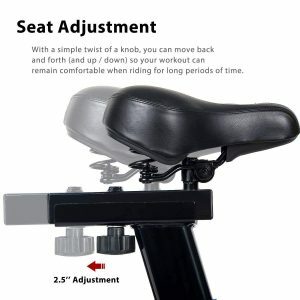 Just in case you wish to swap the seat with another type of your choice, probably with a typical bicycle seat you can do because it has a standard connection mechanism. The handlebar featured on the Merax Deluxe Indoor Cycling Trainer Bike is ergonomically designed with multi-grips. This makes it possible to work out in a different angle that makes your workout fun and productive. 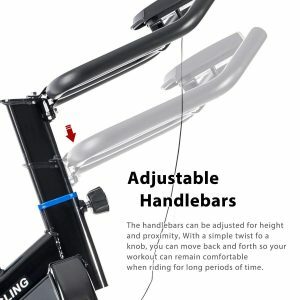 The handlebar is covered with soft rubber foam that is intended to provide a firm and comfortable grip that prevents slippage and blisters in the palm. It is 2-way adjustable, i.e. upward and downward. This compliments the seat’s adjustability to provide maximum suitability. However, it does not have the HR sensors embedded on it just as the case with other spinning bikes. The pedals on the Merax Deluxe Indoor Cycling Trainer Bike are integrated with toe cages that secure the feet and provide leverage for aggressive thrust during workouts. This means they only support standard gym shoes but you can swap them for a set of dual sided pedals that can also allow you to use spin shoes as well. The pedals allow users within the stipulated weight range the bike supports to perform the stand-up pedaling. The Merax Deluxe Bike is a belt driven bike that operates smoothly and quietly. The belt drive system is also popular because of the fact that it does not require any sort of lubrication or adjustment just as the case with a chain drive system. A user can workout at any time of the day without feeling that the family or the neighbors will be disturbed because of the quiet performance of the bike. The drive consists of the V-belt, pulleys, perimeter weighted flywheel that weighs 22 pounds/10 kg, 3-piece crankset, solid crank arms and the pedals that are made of aluminum alloy. However, the flywheel on this bike is not as heavy as the ones on most commercial bikes which is often around 40 pounds and above, but it still provides consistent momentum that delivers quality exercises. You can pedal in reverse to exercise more muscle groups but you cannot coast as you could with a bicycle. The reason is that the drive is designed in a way that makes the pedals and the flywheel to spin simultaneously making it impossible to coast. 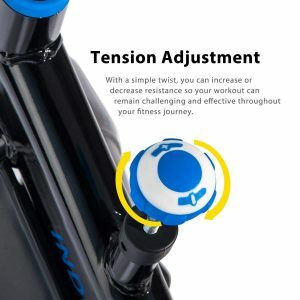 The resistance system on the Merax Deluxe Indoor Cycling Trainer Bike is friction. This means that it uses a brake pad that makes a direct contact with the flywheel to generate resistance. The closer and tighter the brake pad is on the flywheel the more challenging workout it provides. The resistance is easily adjusted via the tension knob by turning it clockwise to increase the resistance and anticlockwise to decrease the resistance. It does not have specified resistance levels, in other words, it is known as a variable resistance with infinite resistance level. Friction resistance provides difficult workouts and often suitable for all fitness level individuals but since it does not have specified resistance levels it will be difficult to keep track of your strength and endurance improvement because you won’t know if you have progressed from one resistance level to another. The console that comes with the Merax Deluxe Indoor Cycling Trainer Bike is basic but displays enough workout values that could keep you motivated and focused. It has a single MODE button that is used to navigate through the monitor. The workout data displayed by the monitor are time, speed, distance, and calories burned. They are displayed with high readability, however, could be compromised if viewed in poorly-lit room or environment because it is not backlit. The monitor has a default SCAN function that rotationally displays the entire workout data one at a time but it is also possible to use the single button on the console to select a certain workout data you prefer to display constantly. Press the MODE button once to turn ON/OFF the monitor, but the monitor can also be turned ON when you start pedaling without having to press the MODE button. It auto shuts down when there is no activity on the bike for a few minutes in order to save the battery power. The speed and the distance are shown and measured in km/h and km respectively. Obviously, the monitor is powered by batteries. 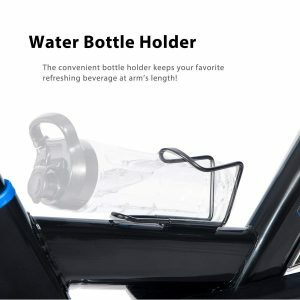 The Merax Deluxe Indoor Cycling Trainer Bike is integrated with a water bottle holder for hydration. This is the only accessory available on this bike. The Merax Deluxe Indoor Cycling Trainer Bike doesn’t take up much space for storage because it is compact. Basically, the adequate storage area for this bike would be 3.5 feet long by 1.8 foot wide. The bike’s height is about 4 feet, therefore, it could be stored under the staircase or just next to the wall. The approval rating of a product helps to shape the opinion of the person searching for that product because it will be easy to draw conclusions as to how good or bad a product is by just reading through the reviews of the real users and seeing the average approval rating as well. That said, The Merax Deluxe Indoor Cycling Trainer Bike has about 20 Amazon customer reviews with an average approval rating of 4.4 stars out of 5 stars at the time this review was written. This shows that this bike is well received and popular. 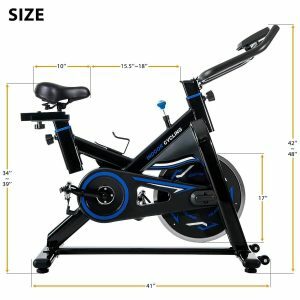 The shipping cost of the Merax Deluxe Indoor Cycling Trainer Bike is actually determined by the retailer that is selling to you. However, some vendors such as Amazon provides free shipping for the United States residents and delivers the product within days of order. The Merax Cycling Bike is not so difficult to assemble because it comes with the major components preassembled. All there is to do by you is to attach the handlebar and the seat posts, the seat, the handlebar, the front, and rear stabilizer bars, and the monitor to the frame. These won’t take more than 30 minutes to assemble. The tools needed for the assembly and the instruction manual that could guide you through the process of the assembly are all included in the package. Just as aforementioned, there is no major maintenance required in this bike. The integrated belt drive system does not need any lubrication or adjustment, except that the brake pad for resistance might need a replacement at some point in time, but this will take a long time before it will happen. Other than that, you are expected to always examine the bike before use for any loose or broken part in order to avoid an accident and prevent further damage to the bike. Also, ensure to always keep it clean from dirt and sweat. The Merax Deluxe Indoor Cycling Trainer Bike is an entry level bike with no bells and whistles but has what it takes to experience a productive workout. It is compact and affordable as well which could be a big deal for those living in a small room and on a budget.